Christopher Ward is chronograph C9 Harrison Blue Automatic Chronograph.Christopher Ward is a British watch company that produces watches in Switzerland. Hours C9 Harrison Blue Automatic Chronograph equipped with Swiss automatic caliber Valjoux ETA 7750 with a frequency of 28,800 vibrations per hour, 42-hour power reserve, as well as functions: hours, minutes, seconds, and chronograph. Model comes on a blue alligator strap with stainless steel buckle. Strap color harmonizes with the color of the dial. Water Resistant – 50 meters. 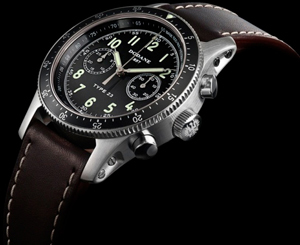 Chronograph limited edition – 250 copies.